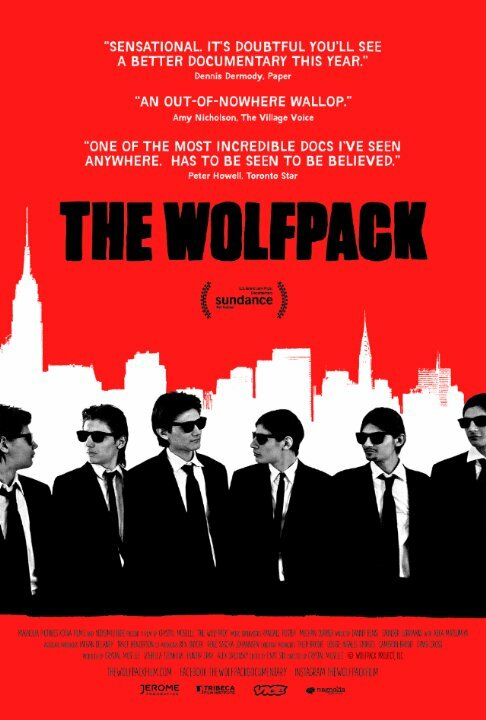 Providing a fascinating introduction to one of the most unique families likely ever captured on screen, The Wolfpack is the rare documentary that works as both a compelling social study and a surprisingly moving testimony to the saving power of cinema. After screening at Hot Docs, and gaining acclaim at Sundance before that, the film is opening at the Bloor Cinema today. Tickets and showtimes can be found right here. Everything the Angulo brothers know about the outside world comes from the movies they watch. Homeschooled by their mother, and raised under the fanatical rules of their Hare Krishna obsessed father, the six teenagers have rarely left their subsidized New York City apartment. They instead spend their days watching movies and copying out the dialogue, meticulously recreating scenes from their favourites like Reservoir Dogs and The Dark Knight, using elaborate homemade costumes and prop weapons crafted from found objects. There are understandably a lot of layers to unfold here, and when the siblings do start to slowly branch out on their own, with their cinema fixations prompting them to dream of more independence, in many ways the story becomes even more intriguing, begging for a follow up sometime down the road. Director Crystal Moselle has struck documentary gold with these subjects, and The Wolfpack offers a fascinating and sometimes even disturbing glimpse into their often bizarre lives. This is a remarkable achievement on many levels, not least of which being the unprecedented access that the first time filmmaker gains into their world, filming the family in their apartment where few other outsiders are allowed. But equally revelatory is the empathy that she has for their story, always observing but never judging or interfering with their unique situation. Although some audiences will find too many questions left unanswered, one of the most intriguing and unshakable aspects of the film is just how relatable this all feels, and the naturalism with which they present their story. Entertaining, emotionally involving and even weirdly inspiring, The Wolfpack is an incredible and entirely unique portrait of delayed awakening, and the power of cinema to literally open our eyes to the world. This is one of the most fascinating and compulsively watchable films of 2015. ← Review: Live From New York!